Here’s a nice companion to William Tyler’s record release show last month at Rough Trade NYC. That show was the start of his tour for Goes West and as it turns out, was only a small preview of what he’s been up to. 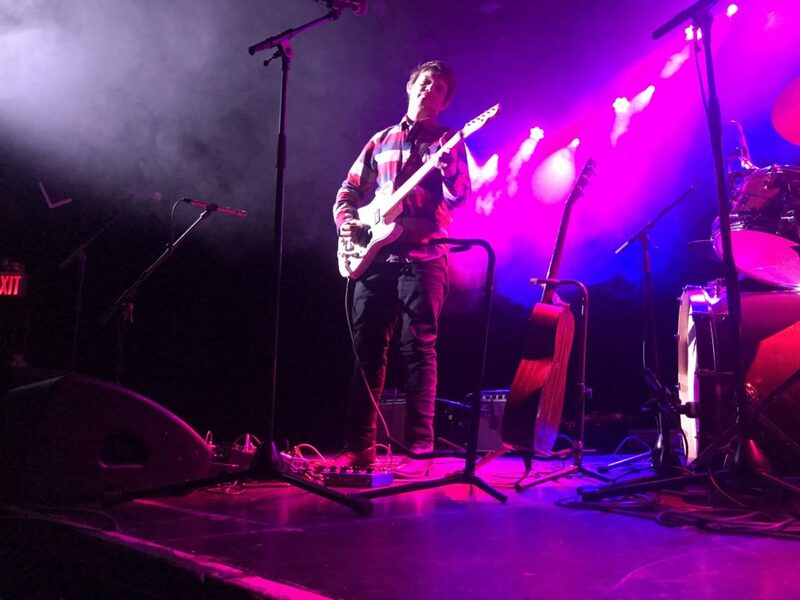 For the (Le) Poisson Rouge crowd, Tyler pulled out all the stops, playing acoustic and electric songs, and inviting locals Steve Gunn and Ryan Sawyer to join in for a few. Gunn plays on “High Anxiety” from Modern Country and contributes guitar and vocals to a cover of Michael Chapman’s “Among the Trees.” Things kick into high gear when Ryan Sawyer joins Tyler for “Whole New Dude” from the Lost Colony EP. They make an outstanding duo and the energy on that song is just incredible. Is there hope someday for a Tyler-Gunn-Sawyer jam sesh? Let’s plant the seed. I recorded this set with the MBHO hypercardioids, combined with a board feed courtesy of the venue and engineer, Jason. The sound is outstanding. Enjoy! Almost exactly a year since we last saw Tortoise, the band rolled back into town for a two-night stand at (le) Poisson Rouge and the Hall at MP. The great thing about seeing Tortoise—and it’s why I come back year after year—is that they’ve got such a vast catalog that there’s always new material to hear along with a revolving cast of deep cuts the band brings out on tour. Like last year’s setlist, this one from (le) Poisson Rouge airs a batch of newer songs off last year’s The Catastrophist, including the title track, “Hot Coffee,” “Shake Hands With Danger,” and again brings out Georgia Hubley to sing on “Yonder Blue.” Adding a few songs we hadn’t heard last year like “Ten-Day Interval,” “Crest,” and “Dot/Eyes,” the band also goes super-deep with “Tin Cans & Twine” from the very first Tortoise album. I recorded this set with the AKG hypercards clamped in front of the soundboard, combined with a board feed courtesy of the LPR crew. The sound quality is outstanding. Enjoy! The Antlers are currently experiencing that in-between-albums and between-tours lull that bands enjoy after working non-stop for years in row. The period usually includes writing in the studio, solo projects and unfortunately for fans, a dearth of shows. 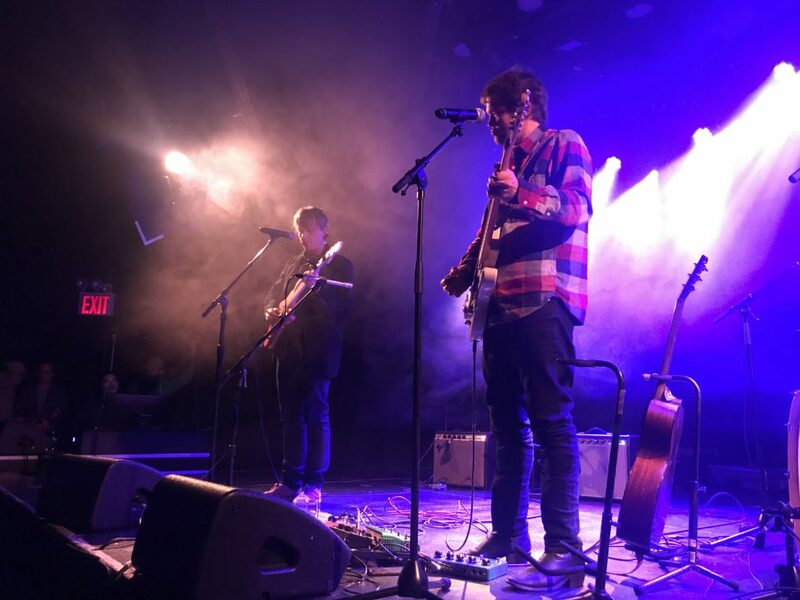 Last Wednesday, it was the celebration of the 5th anniversary of the eclectic and groundbreaking club Le Poisson Rouge that brought the band out to play a sold out one-off show. The band’s singer and guitarist Peter Silberman at one time worked at LPR before the Antlers became his full-time vocation, and in fact the first listening party for the original self-release of Hospice took place at the club. Several years hence, the band now has two more releases to their name — enough material to play a full 90 minute show virtually without pause. The setlist was a democratic selection from each of the recent releases, including 3 of the 4 songs from last year’s Undersea EP, about half of Burst Apart, and some prime material from Hospice. We are streaming “Wake”, a powerful version that ended the main set. I recorded this set with the Sennheiser cards in back of the room mixed with a superb stereo soundboard feed. Due to the position of the mics, I picked up a ton of chatter and this mix is primarily the board. Enjoy! If you download this recording from NYCTaper, we expect that you will PLEASE SUPPORT The Antlers, visit their website, and purchase their official releases from the Antlers Store [HERE]. To paraphrase the late Jerry Garcia, not everybody knows who Mike Watt is, but those who do really appreciate Mike Watt. 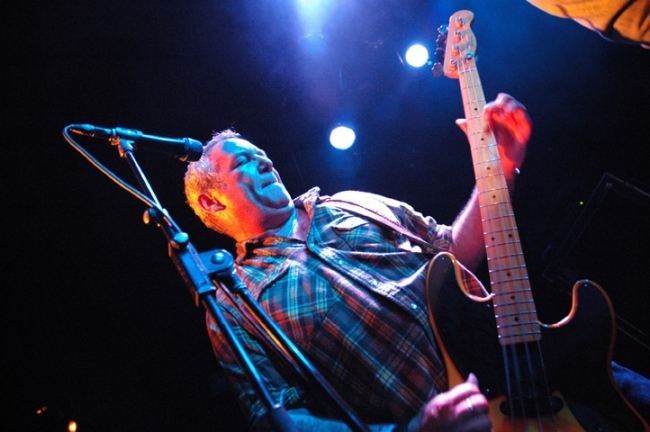 Having long been established as an elder statesman of punk, post-punk and alternative rock starting with the seminal Minutemen and the inspired fIREHOSE, his versatility has allowed him to play with many musicians of different stripes and genres. He’s a bass player’s bass player; the go-to guy who you know will hold down the low-end duties superbly and is not afraid of working hard. If it doesn’t already, his business card should read, “Have bass, will travel.” That’s why when people in the know hear that Watt is coming to town, they run and don’t walk to get to the gig. Initially announced as the NYC launch of his new book, ‘Mike Watt: On and Off Bass‘, and calling the event “Mike Watt & Friends”, word had it that he was also planning to dust off the Hellride East moniker (one of his many projects) and play Stooges tunes with J Mascis and Murph from Dinosaur Jr. After an interview session with noted music writer Byron Coley, the music kicked off and it was indeed The Stooges from their first two excellent albums. In his element, clearly enjoying himself and fingers hammering the strings, Watt and Mascis were the only two constant musicians during the set. At any given time the drummers were rotating between Murph, John Maloney and Sonic Youth‘s Steve Shelley. SY’s Thurston Moore took a turn or two on vocals as did Don Fleming, John Petkovic (also playing clarinet), Sharon Van Etten, Kurt Vile, Byron Coley and Noel Ford, the former soundman from the Continental (and current one for Dinosaur Jr.) or so I was told. It was a whirlwind trying to keep up with the cavalcade of performers who kept jumping on stage. 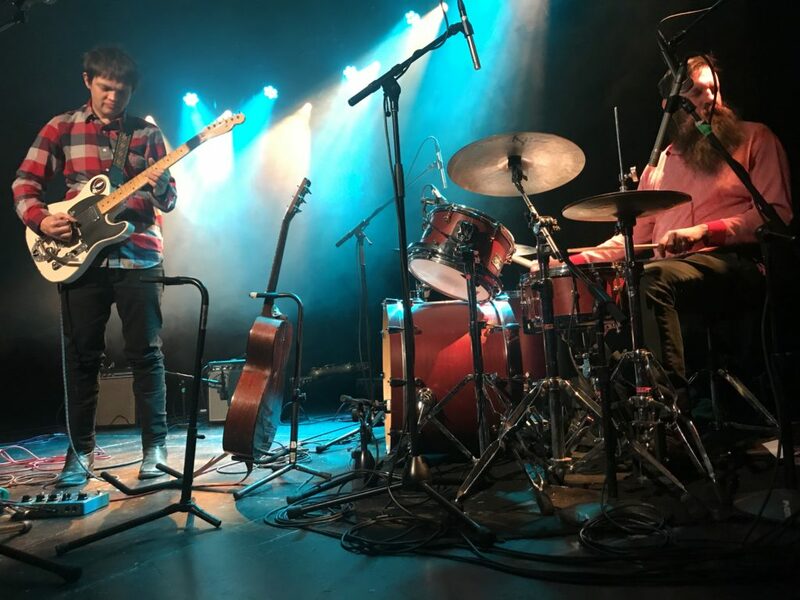 With the pervasive sense of “what’s next?” in the air and the close proximity of all these great artists, the small Le Poisson Rouge felt more like a party at a friend’s house with a killer band than a concert. That atmosphere prevailed even more so when the music ended and everyone milled around chatting and drinking while the guest of honor signed copies of his book and greeted all comers with a handshake. A truly unique evening and, personally, I can’t wait for Mike to pop up here in our city again. Wondering in just what permutation that will be should prove almost as much fun. 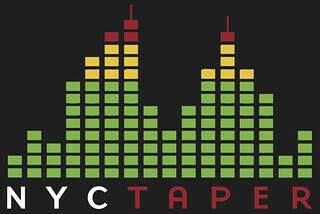 This night at Le Poisson Rouge presented a unique recording opportunity for us. Rather than having to set up towards the back of the room so as not to be in the way, we were able to park our rig right at the stage lip and nearly dead center. Recording in this manner makes the separation of the instruments and where they were on stage very distinct. A monitor was just off to our right so while the vocals aren’t entirely centered, the overall effect is really cool and the next closest thing to being right up front at the show. We hope you like what you hear as much as we did. Enjoy! Special thanks to Mike Watt and all the performers for making this recording possible, and to Frankie, Bernie and the staff at Le Poisson Rouge for their courtesy and cooperation. If you download this recording, we expect that you will PLEASE SUPPORT Mike Watt, the performers and their projects, go see their shows, visit their websites (Mike’s is HERE), and purchase some of their official releases and merchandise [HERE] and [HERE].